One of the more unlikely matchups in ALCS history begins Friday night in Baltimore as the Royals and Orioles, neither of which has been this far in the playoffs in almost two decades, battle for a spot in the World Series. We’ll break down this matchup here, beginning with the pitching. When the Orioles signed Ubaldo Jimenez to a four-year $50 million deal last offseason, they were hoping he could be their top starter. Instead, Jimenez has struggled—a 4.81 ERA over 25 games with a 6–9 record. Fortunately for the Orioles, they have a number of starters who’ve put up better numbers than him—Chris Tillman, Wei-Yin Chen, Bud Norris, and Miguel Gonzalez—though none is a true No. 1. The Royals possess the best starter in the series—James Shields—but match up very similarly after him. Jason Vargas, Yordano Ventura, and Danny Duffy are all unheralded starters with ERAs under 4.00, but since the Royals have the better top starter, we’ll give them the nod here. Slight advantage: Kansas City. The Royals boast the game’s best 7th, 8th, and 9th inning combination of Kelvin Herrera, Wade Davis, and Greg Holland. Amazing, each has an ERA under 1.50. Beyond them, the middle relievers have been a problem all season. If you knock out the starter before the 7th, they’re very vulnerable. Baltimore’s relievers have a combined 3.10 ERA (to Kansas City’s 3.30) and they’re led by closer Zach Britton. Britton has 37 saves and a 1.65 ERA. 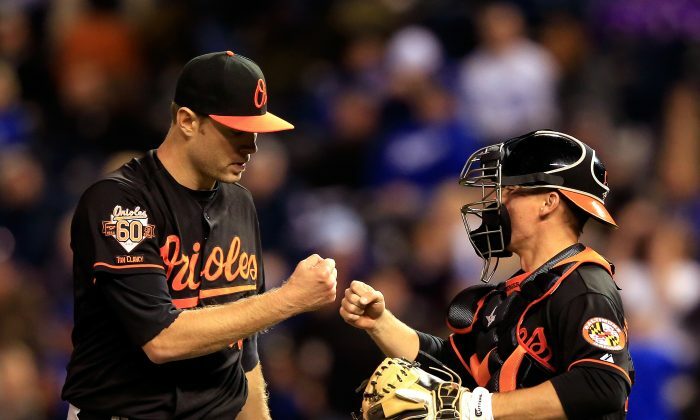 Former closer Tommy Hunter (2.97 ERA) along with Darren O’Day (1.70 ERA) and Andrew Miller (1.35 ERA) make up Baltimore’s late-inning relievers. Both are a major strength of each team, but Baltimore has a deeper group. Slight Advantage: Baltimore. How Baltimore got this far without regulars Matt Wieters and Manny Machado—who played a combined total of 108 games this year—is a testament to manager Buck Showalter. As if that wasn’t hard enough, first baseman Chris Davis, who hit 53 home runs and drove in 138 runs in 2013, slumped to 26 and 72 with a .196 average this year, and is out for this round of the playoffs following his suspension for amphetamine use. Still the Orioles led the league in homers with 211 as Nelson Cruz slugged a league-high 40. Cruz, who hit six home runs in the 2011 ALCS against the Tigers, has continued his clutch ways in 2014 with a pair of homers against Detroit again in the last round and has a ridiculous career postseason slugging percentage of .710. Conversely, the Royals’ lack of home runs this season has been well-chronicled. The team was last in home runs in the regular season but first in steals, and they’ve been even more aggressive come playoff time. Through four postseason games, they have 12 steals in 13 attempts, including a postseason-record seven against Oakland in the wild-card game. But Baltimore starter Chris Tillman, because he has such a fast delivery, has allowed just two steals against him over the past two years. In addition, Orioles catcher Caleb Joseph has thrown out 40.4 percent of would-be base-stealers this year—tops in the game. If the Royals can’t run, their offense goes from average to below-average very quickly. Advantage: Baltimore. Both teams are excellent defensively. Adam Jones has won three Gold Gloves in center field for the Orioles, while Alex Gordon has won three straight in left field. While J.J. Hardy has won a pair of Gold Gloves at short, Alcides Escobar is right behind him for the Royals and might pass him up this year. The game-changer here is when Kansas City inserts Jarrod Dyson for Nori Aoki and moves Lorenzo Cain to right field—not much drops in the outfield, as the Angels can attest to. Slight advantage: Kansas City. While Royals fans had to hold their breath when manager Ned Yost removed Shields in the 6th inning against Oakland, only to bring in Ventura (who’s not a reliever) who got shelled, the Orioles have one of the better ones in the game in Showalter. Showalter’s worn out his welcome for reportedly getting on his players too hard in past stops with Texas, Arizona, and the New York Yankees, but he certainly gets results. Slight advantage: Baltimore.